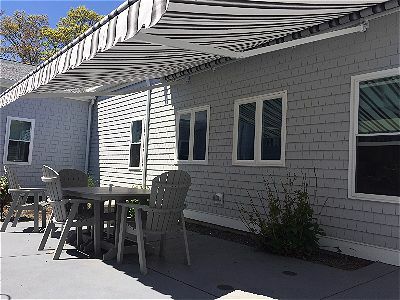 A retractable awning that covers a small private patio in Dartmouth, MA. 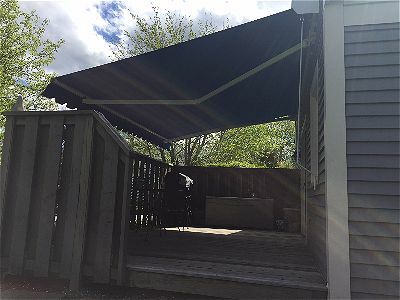 This custom retractable awning thoroughly covers a small patio in Dartmouth. It was measured to fit the space exactly so that there was enough room even when it is rolled out to operate the grill. On a hot summer day there is nothing better than a little shade from a retractable awning and a cool drink! This stone patio was was unbearable to sit on during the day time. A stone or concrete patio can be brutal to sit on during the day time. The surface material absorbs a lot of the sun’s heat and radiated it up towards anyone in contact with it. 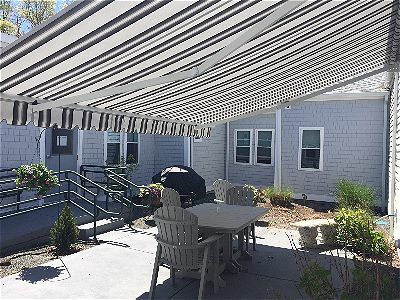 A retractable canvas awning for this space was a no brainer because without any shade this nice outdoor courtyard was unusable. Another view of the same concrete patio, not with the table and chairs protected by the shade of the retractable awning.